Losing your luggage on the way to Ethiopia must have been very interesting and slightly panicking, how did you manage and where did you buy replacement clothes and toiletries from? It wasn’t so much panic, more annoyance! Luckily I was travelling with a group of friends who always pack too much so I could borrow some stuff from them. I also went shopping to Shola market, the 2nd largest market in Addis Ababa and where many of the locals go. It is big and busy so was quite daunting at first but I soon got into the swing of bartering and making elaborate hand gestures and facial expressions when I thought the price was too high! I managed to get 2 pairs of shorts, 1 pair of trousers, a hoodie, 3 vests, 2 t-shirts, underwear and some trainers for less than £50! Was there a language barrier – was communication easy? In Addis Ababa and tourist areas people working in shops, hotels etc all tend to speak some English. I learnt a few basic words in Amharic (working language of Ethiopia), thank you, hello, dancing! In general you can get by with hand gestures and pigeon English but if you need something specific – such as medication I would suggest finding a good English speaker to translate! Where to eat? And what food must you try whilst your there? You must try some dishes served on injera which is a flat sourdough made from teff – a plant grown exclusively in Ethiopia. 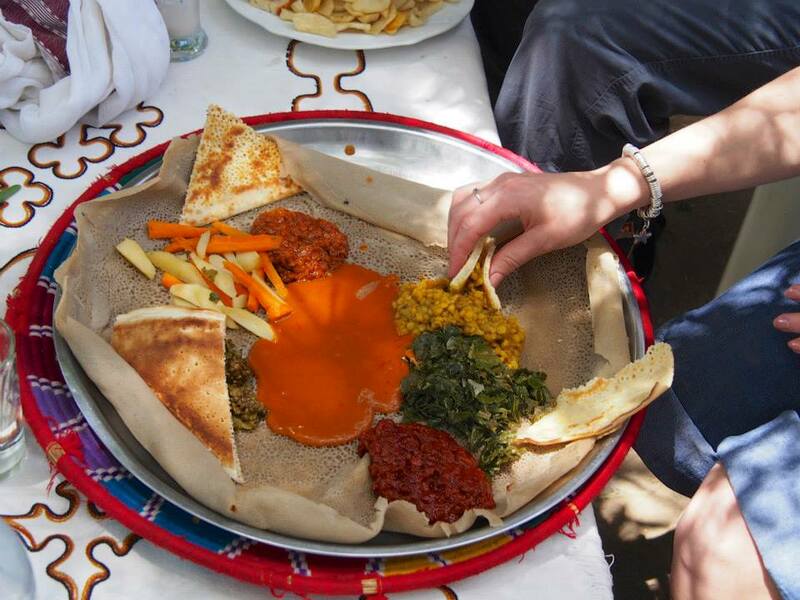 Injera doesn’t taste of much itself but Ethiopians eat with their hands and injera is used to pick up meats, vegetables and various other dishes normally cooked in spices. I’ve heard the Ethiopian coffee is one of the best – is this true? What was your favourite brand? Ethiopian coffee is amazing! Macchiato’s (espresso with frothy milk) were my favourite. I only know 2 brands Tomoka or Robrero – both are good! We enjoyed 2 traditional coffee ceremonies on our trip. It is considered a mark of friendship or respect to be invited so we felt privileged to be involved. Coffee beans are roasted and then ground in front of you and popcorn was freshly made to accompany the coffee. The smell is amazing!! 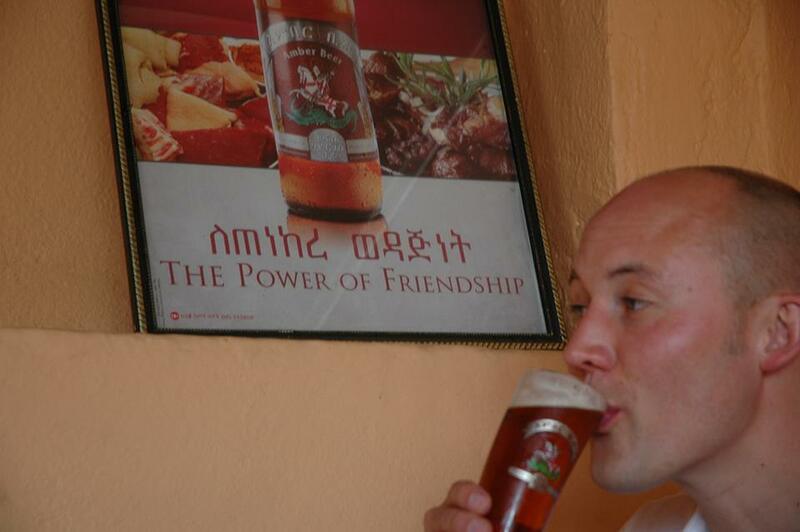 There are loads of good beers in Ethiopia! And it is all so cheap! St Georges was probably my favourite. We went to a beer garden next door to the Dashen beer factory in Gondar. They serve unpasteurised Dashen beer in the beer garden which was lovely at the time but we all felt pretty rough the day after, though we did stay there drinking for 6 hours! Other good tipples are Meta, Amber (their advertising slogan is ‘The power of friendship’! ), Caster….we sampled a lot! Tej is a traditional honey wine normally homemade but you can buy it in bars – you definitely have to try it if you visit Ethiopia! What’s the best way to travel around? We were a group of 11 so organised for mini buses and guides to show us the sites in each of the areas we visited. They can be organised through hotels or some are recommended on travel websites. Average cost was around £50 a day, a bargain between 11! 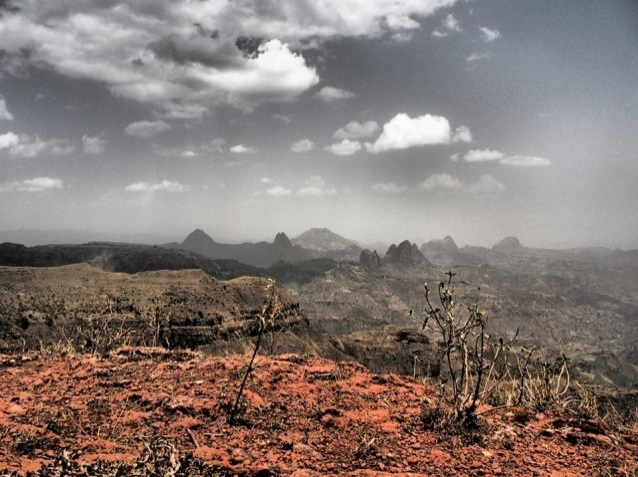 Internal flights were good – but are much cheaper if you book when you are in Ethiopia. Most taxis are quite old but full of character and definitely an experience – though the language barrier can be an issue if you are not going to a well-known place. 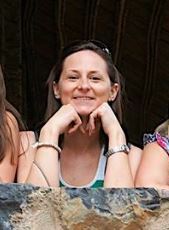 Was it safe to travel around independently? Ethiopian people are incredibly friendly. As long as you are sensible (be careful at night, only go to remote places with a guide or if you know they are safe) then you should be fine. Locals may hassle you to buy things (lovely scarfs and craft things on offer) however if you are firm but polite they will go away. A lot more than I thought it would be! Most hotels have Wifi in the reception or communal areas. What are the biggest challenges you think Ethiopia is currently facing as a country? Over population – approximately 90m people live in Ethiopia. The population is growing every year and over 90% of the population live in poverty. The country has huge development challenges in terms of education, health, water and sanitation. The Ethiopian economy is massively dependant on agriculture so climate change is also a huge issue. There is still a big gender imbalance and lack of any decision-making power for women in the country. Finally what would you rate as being the best things to see and do? 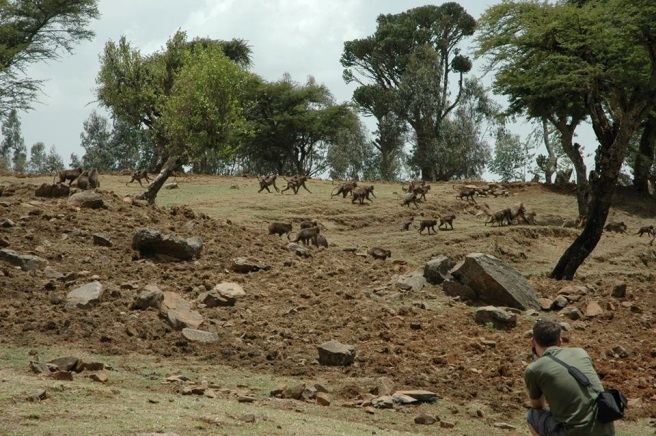 The Simien mountains were incredible. 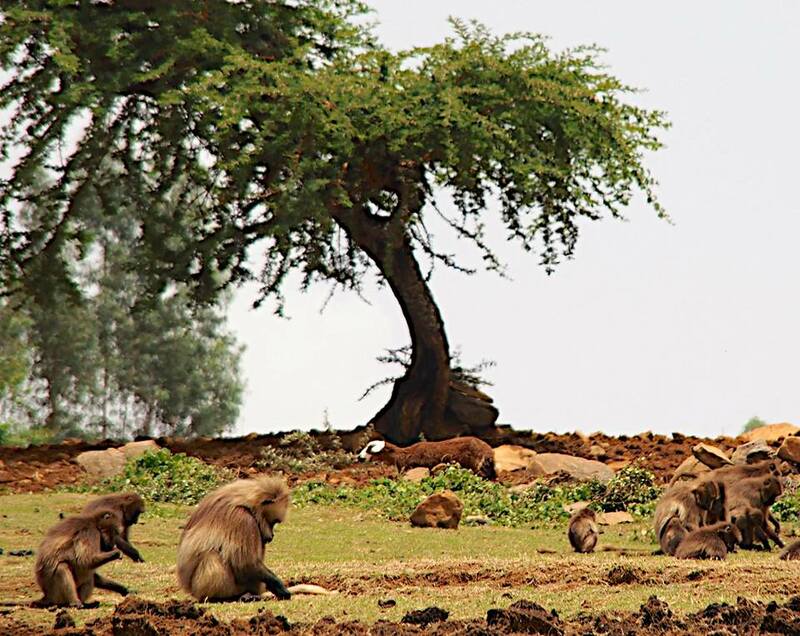 We only went to the edge of the Park – about an hour’s drive from Gondar but we did an amazing trek which had incredible views across the Simien mountain range and where we came across a tribe of Gelada Baboons! There were at least a hundred of them chilling out and playing right in front of us. 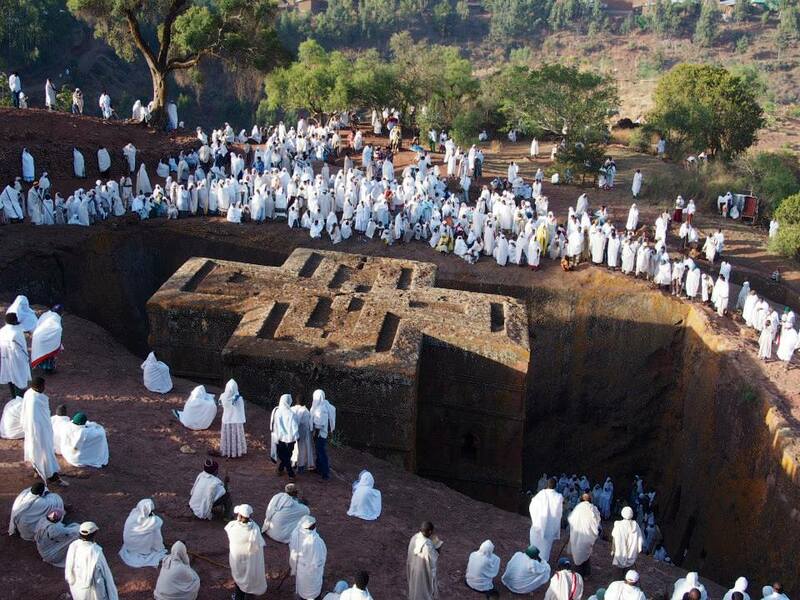 The monolithic churches cut out of the rock in Lalibela are fascinating. I still struggle to get my head around the fact that someone came up with the idea to carve a church out of the rock, ad that it was all done using tiny hand hoes – definitely wouldn’t have the patience!